No Time for the Olive Branch: In conversation with Palestinian artist Samia Halaby whose work is exhibited at London’s Ayyam Gallery until November 30, 2013. In her words, Palestinian artist and academic Samia Halaby has the defiance of the Palestinian writers Ghassan Kanafani and Mahmud Darwish and the activism of 1970s New York. She is in London for her work, and yet she does not feel beholden to any critic. Years of jousting with cut-throat New York art critics has taught her not to care for the gatekeepers of culture—you either like her work or you don’t. Critics might accuse the majority of the Palestinian diaspora’s work as being political, and by implication less worthy of praise. But Halaby embraces the label. “Semantics!” she says to The Majalla, “Don’t be fooled: everything we do is political. Staying silent is political . . . Yes, my art is political.” In fact, Samia Halaby is the walking embodiment of political. She is the Palestinian experience in the flesh—an exile, an activist, a rebel—and she is not going to compromise now. Samia Halaby was born in 1936 in mandated Jerusalem to an established Arab Christian. Her father was a self-made man who established an importing business, subsequently moving the family to Jaffa. Her memories of this period are idyllic: attending British colonial school, green hedges, a busy port city, and fresh fish being brought in from the blue ocean. She also remembers being huddled up in her home as men dashed in with buckets of water and blood trickling down the floor. She remembers the tanks entering Jaffa, oppressive British rule, and Eastern European Jews coming to the Holy Land. She talks of how Arabs in pre-mandate Jerusalem saw themselves as Syrian Arabs, and felt a close affinity to Damascus and Baghdad. Despite having a US passport, Halaby sees herself as a Palestinian Arab belonging to a greater Arab world. Though pan-Arab in many ways, she does not relate herself to the pan-Arabism of Nasser, but rather one which recognizes the cultural milieu of her forefathers. She recognizes that despite her loss of faith, she grew up Christian in a mostly Muslim environment, and appreciates all aspects of those faiths—yet her art is her own. LONDON.- Ayyam Gallery London presents an exhibition of paintings by pioneering Palestinian artist Samia Halaby, who is widely credited with inspiring the new school of abstraction in contemporary Arab art. Parallel to her artistic career, Halaby is an active political campaigner for Palestine, as well as a scholar who has been instrumental to the documentation of Palestinian art, publishing her landmark text ‘Liberation Art of Palestine: Palestinian Painting and Sculpture in the Second Half of the 20th Century’ in 2002. Samia Halaby, Pink Clouds, 2013, Acrylic on Linen Canvas, 183 x 152.5 cm. Over the past fifty years, Halaby has built upon historical abstraction in painting, such as that of the Russian Constructivists, merging this with traditional Arabic arts and Islamic architecture. Her rich and varied oeuvre is characterised by a compelling energy and an unceasing commitment to experimentation; in the mid 1980s, Halaby taught herself computer programming in order to create a series of digital kinetic paintings with sound later using her programmes to perform live with percussionists. At the age of 77, she continues to produce work that challenges conventional approaches to painting and this latest exhibition at Ayyam Gallery London displays new abstraction emblematic of her innovative approach. Artspace London is thrilled to announce the upcoming show, From Palestine With Hope, featuring works by Jeffar Khaldi and Tarek Al‐Ghoussein. From Palestine With Hope will challenge the viewers’ perceptions of the human costin Palestine, as well as their attitudes towards the reality of the consequences of conflict. Artspace London believes that art can nurture hope and peace and this wish for Palestine is strongly seen through the works of Khaldi and Al‐Ghoussein. Both artists have different styles, yet the major theme of a never‐ending belief in a Palestinian homeland is striking in both their works. From Palestine With Hope comes at a time when many Palestinians are looking to the future for a life free from aggression, occupation, and conflict. 20% of the sales proceeds from From Palestine with Hope will be directly donated to Medical Aid for Palestinians (MAP). Established in the aftermath of the 1982 massacre of Palestinian civilians at the Sabra and Shatila refugee camp in Lebanon, MAP works towards re‐establishing the health and dignity of Palestinians living under occupation and as refugees. MAP is an international, non‐governmental, independent, non‐ political, non‐religious organization. It is with great honour that Artspace London is collaborating on this exhibition with MAP. Palestinian artist Jeffar Khaldi (b. 1964) was born and raised in Lebanon. Before moving to Dubai in 1995, he studied architecture and interior design in the United States. In his works, Khaldi draws upon his multi‐cultural and diverse upbringing and merges his own experiences and memories with those of the Palestinian people. However, Khaldi is adamant that his work is by no means meant to be political nor does he want to force his opinion onto the viewer – he is more concerned about leading the viewers to draw their own conclusions through the political, social and contemporary images that he uses. With his theatrical use of wit, intelligence, emotion and pop culture imagery, Khaldi’s works successfully questions various notions that are commonly accepted or refuted – depending on the viewer’s own beliefs. Tarek Al‐Ghoussein (b. 1962) was born in Kuwaitto Palestinian/Kuwaiti parents. Al‐Ghoussein moved to the USA for his BFA in Photography at New York University, and continued his studies with an MA in Photography at theUniversity of New Mexico. Al‐Ghoussein’s early experiences as a photo journalist has affected how he confronts his artistic output and, currently working as a professor of photography, has placed his conceptual and forward‐thinking compositions ahead of many Arab photographers working today. From Palestine With Hope will present paintings, photography, and mixed media works in a manner to provide a beacon of hope and reassurance that contemporary Palestinian art and charity has a place in the hearts and minds of viewers, collectors and enthusiasts. Talhami was born in the Arab Israeli city of Shefa-Amr. She studied singing at the Rubin Institute in Jerusalem, where she currently resides, for five years, graduating in 1996. She has participated in a number of local and international festivals, singing songs that primarily express Palestinian heritage and nationalism. Since the imposition of the Israeli blockade, the Gaza Strip has been characterized by a state of cultural stagnation. This is due to the difficulty artists and intellectuals have faced traveling between the West Bank and Gaza through the Rafah crossing since the first years of the blockade. This is compounded by the pressures resulting from the political divide between Fatah and Hamas. Talhami explained, “It was a great honor for me to be a part of this artistic work, which was in preparation for two and half years before now being revealed to the public. I am very proud of it. Although I wanted to record the album in a studio in Gaza, circumstances prevented us from doing that.” She described as “shameful” the West Bank–Gaza political divide and lamented the inability of the Palestinian people, “who have confronted various challenges,” to force politicians to reach a compromise to restore unity between the two parts of the nation. Those attending the Gaza concert, mostly youths, of both genders, swayed to Talhami’s songs at times and applauded at others. The joy was apparent in their faces. Rahaf al-Batniji, 22, agreed with Rizaq, and offered that it was the first time she had attended a concert with singing of this kind. These songs left a notable impression on her psyche, which has endured political and psychological pressures in her daily life. Since taking power, the Hamas-led government in Gaza has typically banned all private music concerts. They justify the ban by arguing that the concerts do not reflect the “customs and traditions” of the Palestinian people. 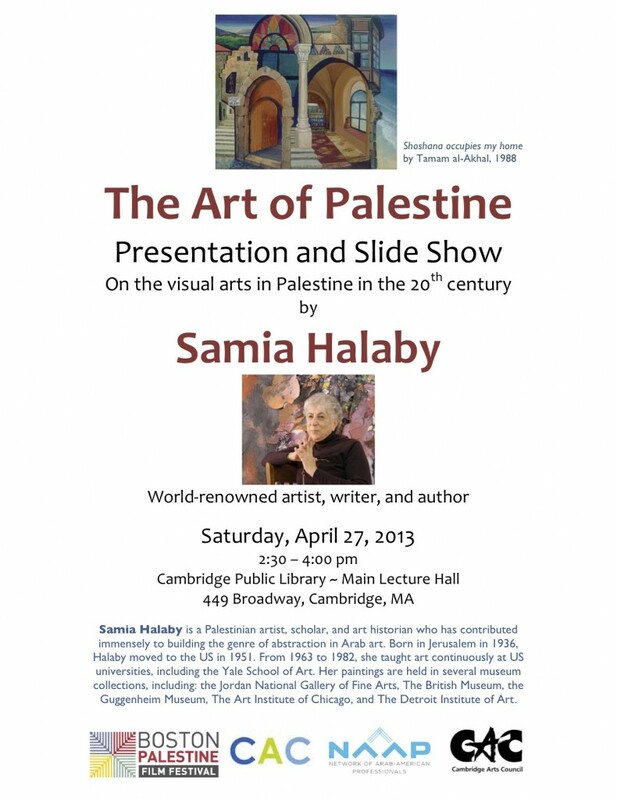 The Boston Palestine Film Festival announces that world-renowned Palestinian artist Samia Halaby will give a presentation entitled The Art of Palestine on April 27, 2013. For information visit Boston Palestine Film Festival.